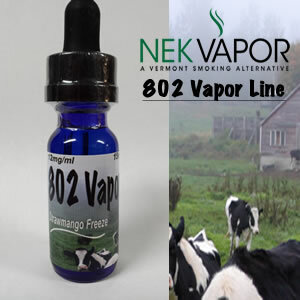 802 Vapor e-liquids are produced by NEK Vapor. Here in Vermont’s Northeast Kingdom, people have a reputation for doing things differently. We are stubborn. We believe in helping our neighbors. We know that the best value doesn’t always come at the lowest price. We make things to a standard. It’s called a “belt and suspenders attitude." We like to do things right or not at all. When NEK Vapor opened in 2014, our mission was to provide the community with the best alternatives to smoking with an unmatched level of quality, service, and support. We are proud of our 802 Vapor line of custom blended e-liquids. Starting with the highest quality base, our e-liquids use FDA approved food-grade flavorings and pharmaceutical grade nicotine to deliver delicious flavor and a consistently pleasurable vapor experience. The 802 Vapor line includes flavors designed to delight any taste. From fresh fruits to authentic tobacco flavors, from champagne and orange juice to freshly-baked cookies -- we offer dozens of flavors, and are adding new creations all the time. You can also customize your experience by nicotine level -- from 0 mg/ml to 36 mg/ml. We’ve found that many people begin “vaping” at higher nicotine levels, but are able to reduce their nicotine intake over time. 802 Vapor e-liquids are made in the United States, in a GMP and ISO certified laboratory. GMP and ISO certification means our lab adheres to verifiable standards for cleanliness and quality control. You will never find 802 Vapor e-liquid in a plastic bottle. Our distinctive blue glass bottle is more expensive for us, but we feel it is worth the extra cost. Unlike plastic, glass will not alter the flavor of your “liquid.” The bottle’s deep blue color protects the liquid from light, which can damage many flavors over time. Glass bottles are air-tight, while some plastics are not. Glass is easily recycled, reusable, and comes from an abundant resource. We feel that it’s the best way to assure your liquid has the freshest, tastiest flavor from the first to last drop. Each of our bottles comes with a child-proof cap, a glass dropper, and is sealed with a tamper resistant strip. We regularly stock 15 ml (1/2 oz) and 30 ml (1 oz) bottles, but larger sizes are available on special order. Stop by our Lyndonville, Vermont location to sample some flavors at our tasting bar. If you are interested carrying our line of 802 Vapor e-liquid in your store please contact us.